DOLE’s larger mission is to increase consumption of fruits and vegetables to improve the nutritional health of Americans and work to reverse a number of negative health trends. 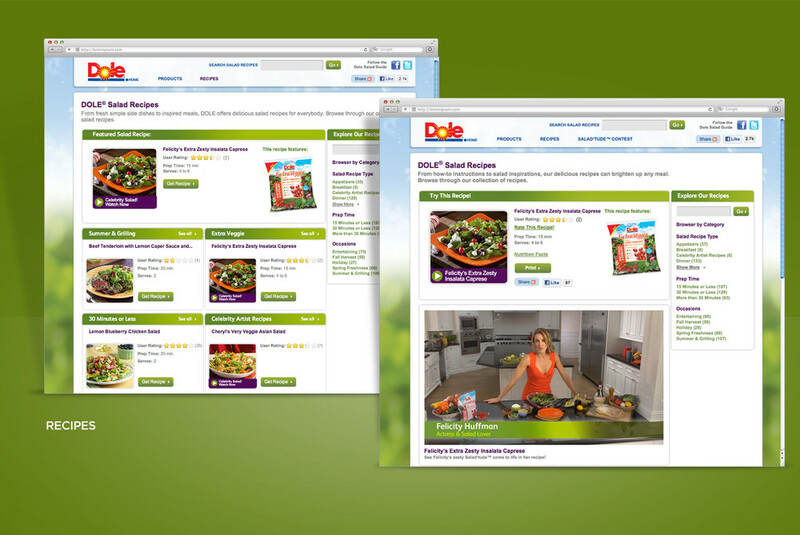 DOLE Salads historically targeted non-food spokespersons and helped position the brand within a broader lifestyle context. The previous year's program featured Candice Olson, Clinton Kelly and Cheryl Burke, and showcased their personal creative inspiration to the art of salad-making. Leverage A-List celebrity talent Felicity Huffman and her connection to Feeding America. Launch a huge facebook contest, “The Big Apple Getaway”. Support the contest with comprehensive digital media tactics. Dole Salads Big Apple Getaway Collect & Win Game (and Instant Win Game) promoted fresh salads and healthy eating to keep the summer cool. By playing the Collect & Win Game, a contestant can win the Grand Prize of a trip for themselves and 4 friends to NYC, to dine with Felicity Huffman ( valued at $40,000). The trip includes personal concierge service, flight & hotel, private gourmet cooking class, spa services, theatre tickets, and $6,000 in spending money. By playing the instant win game, salad lovers will be in the running for $85,000 in prizes. By entering a Code on Facebook, both the Collect & Win Game and the Instant Win Game will be triggered and contestants will be randomly awarded with one of the following five salad ingredients: The Big Apple, The Celery, The Crouton, The Red Onion or The Walnut. Each Salad Ingredient entered into play will be kept in the participant's registration file and will appear on participant's game board each time you log into the Game. Only one Big Apple Salad Ingredient will be randomly awarded throughout the Promotion Period. Once you have collected each of the five Salad Ingredients, you must submit your completed game board to claim the Grand Prize and begin the verification process.